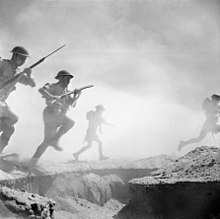 Britain declared war on Germany on 3 September 1939. The 3rd Division was deployed to Belgium as part of the British Expeditionary Force (BEF). During this time, Montgomery faced serious trouble from his military superiors and the clergy for his frank attitude regarding the sexual health of his soldiers, but was defended from dismissal by his superior Alan Brooke, commander of II Corps. 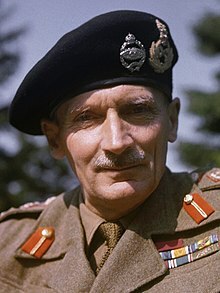 Montgomery's training paid off when the Germans began their invasion of the Low Countries on 10 May 1940 and the 3rd Division advanced to the River Dijle and then withdrew to Dunkirk with great professionalism, entering the Dunkirk perimeter in a famous night-time march that placed his forces on the left flank, which had been left exposed by the Belgian surrender. The 3rd Division returned to Britain intact with minimal casualties. 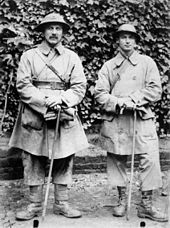 During Operation Dynamo — the evacuation of 330,000 BEF and French troops to Britain — Montgomery assumed command of the II Corps. The next major Allied attack was the Allied invasion of Sicily (Operation Husky). 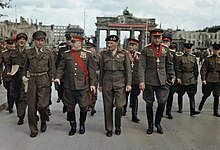 Montgomery considered the initial plans for the Allied invasion, which had been agreed in principle by General Dwight D. Eisenhower, the Supreme Allied Commander Mediterranean, and General Alexander, the 15th Army Group commander, to be unworkable because of the dispersion of effort. He managed to have the plans recast to concentrate the Allied forces, having Lieutenant General George Patton's US Seventh Army land in the Gulf of Gela (on the Eighth Army's left flank, which landed around Syracuse in the south-east of Sicily) rather than near Palermo in the west and north of Sicily. 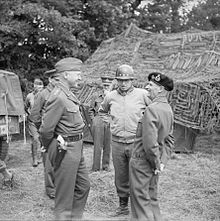 Inter-Allied tensions grew as the American commanders, Patton and Omar Bradley (then commanding US II Corps under Patton), took umbrage at what they saw as Montgomery's attitudes and boastfulness. However, while all three were considered three of the greatest soldiers of their time, due to their competitiveness they were renowned for ‘squabbling like three schoolgirls’ thanks to their ‘bitchiness’, ‘whining to their superiors’ and ‘showing off’. 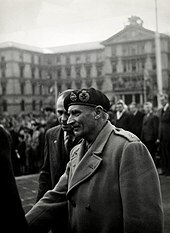 Montgomery returned to Britain in January 1944. He was assigned to command the 21st Army Group consisting of all Allied ground forces participating in Operation Overlord, codename for the Allied invasion of Normandy. Overall direction was assigned to the Supreme Allied Commander of the Allied Expeditionary Forces, American General Dwight D. Eisenhower. 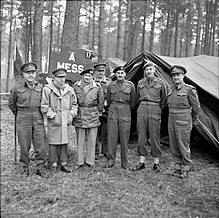 Both Churchill and Eisenhower had found Montgomery difficult to work with in the past and wanted the position to go to the more affable General Sir Harold Alexander. However Montgomery's patron, General Sir Alan Brooke, firmly argued that Montgomery was a much superior general to Alexander and ensured his appointment. Without Brooke's support, Montgomery would have remained in Italy. 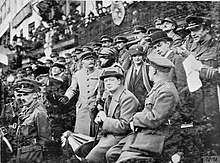 At St Paul's School on 7 April and 15 May Montgomery presented his strategy for the invasion. He envisaged a ninety-day battle, with all forces reaching the Seine. The campaign would pivot on an Allied-held Caen in the east of the Normandy bridgehead, with relatively static British and Canadian armies forming a shoulder to attract and defeat German counter-attacks, relieving the US armies who would move and seize the Cotentin Peninsula and Brittany, wheeling south and then east on the right forming a pincer. 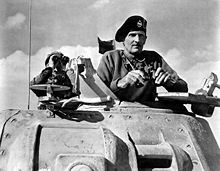 While this diversion of Monty’s was brilliantly achieved, he nevertheless left himself open to criticism by overemphasizing the importance of his thrust toward Caen. Had he limited himself simply to the containment without making Caen a symbol of it, he would have been credited with success instead of being charged, as he was, with failure. 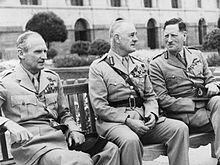 Too much discussion on Normandy has centered on the controversial decisions of the Allied commanders. It was not good enough, apparently, to win such a complete and spectacular victory over an enemy that had conquered most of Europe unless it was done perfectly. Most of the blame for this lies with Montgomery, who was foolish enough to insist that it had been done perfectly, that Normandy – and all his other battles – had been fought accordingly to a precise master plan drawn up beforehand, from which he never deviated. It says much for his personality that Montgomery found others to agree with him, despite overwhelmingly evidence to the contrary. His handling of the Battle of Normandy was of a very high order, and as the person who would certainly have been blamed for losing the battle, he deserves the credit for winning it. The 1960 paperback edition of his memoirs contains a publisher's note drawing attention to that broadcast, and stating that in the publisher's view the reader might reasonably assume from Montgomery's text that Auchinleck had been planning to retreat "into the Nile Delta or beyond" and pointing out that it had been Auchinleck's intention to launch an offensive as soon as the Eighth Army was "rested and regrouped". Montgomery was stripped of his honorary citizenship of Montgomery, Alabama, and was challenged to a duel by an Italian officer. Playfair, Major-General I.S.O. ; Flynn, Captain F.C. (R.N. ); Molony, Brigadier C.J.C. & Gleave, Group Captain T.P. (2004c) [1st. pub. HMSO:1960]. Butler, Sir James (ed.). The Mediterranean and Middle East, Vol. III: British Fortunes reach their Lowest Ebb (September 1941 to September 1942). History of the Second World War, United Kingdom Military Series. Uckfield, UK: Naval & Military Press. ISBN 978-1-84574-067-2. Playfair, Major-General I.S.O. ; Flynn, Captain F.C. (R.N. ); Molony, Brigadier C.J.C. & Gleave, Group Captain T.P. (2004d) [1st. pub. HMSO:1966]. Butler, Sir James (ed.). The Mediterranean and Middle East, Volume IV: The Destruction of the Axis Forces in Africa. History of the Second World War, United Kingdom Military Series. Uckfield, UK: Naval & Military Press. ISBN 978-1-84574-068-9.